Here we show you the history of the project implementation of 2009. The material is sorted, newest at the top of the page. 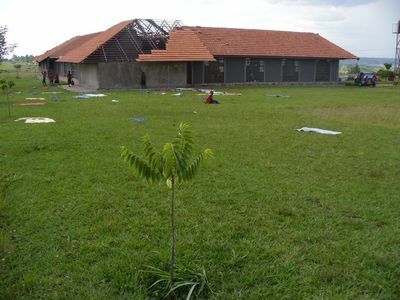 Just before leaving for Europe & the USA we give you an impression of what is happening at the Kimbilio Children’s Village. 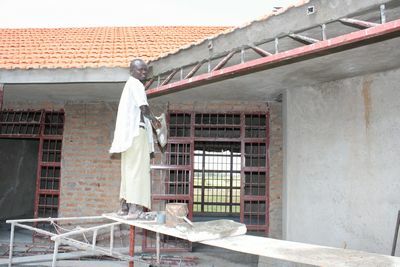 Philip & Owono are working on the final touches of the roof on dowm 1. 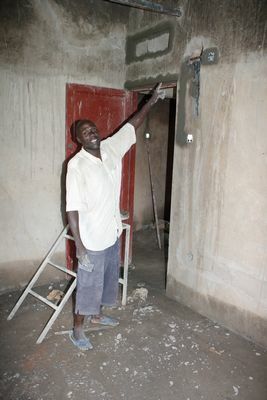 Opendi is showing his work on the matrons appartment in the 1st dormitory. Below: Nelson is working on the roof of the bathroom. 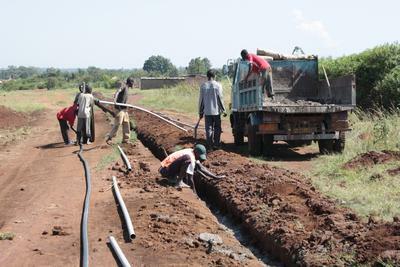 Today we are connecting the lower corner of our land with water and electrical cables. 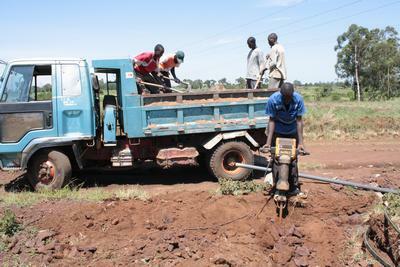 Since the 24th of July of 2009 we have been calling the “UMEME” which is our electricity company. On this day our transformer exploded. We faithfully informed the help-desk of the explosion and it took them TWO MONTHS just to come and look at the situation! 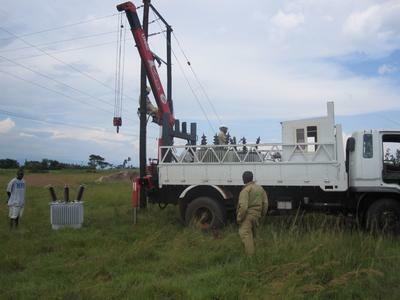 After that they brought an overhauled transformer which they put nicely up in the poles. But do we have power? NO! They have still not connected the thing. Lord, deliver us from the corruption in our land! On the photo left you can see our solution to the problem. 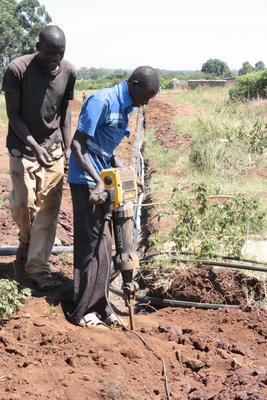 We are digging a bacement for a generator. With these kind of companies supplying you with the essencials, you need to make sure you have your own backup. Soon we will have our own diesel power-supply which by-the-way, is just about cheaper than the price we pay for the grid! 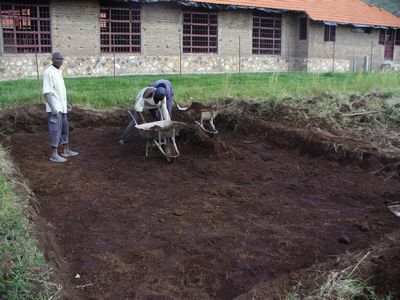 For some time the work on the remaining 8 bed-rooms and the Teachers appartment has been at a standstill, waiting for some more project funding. 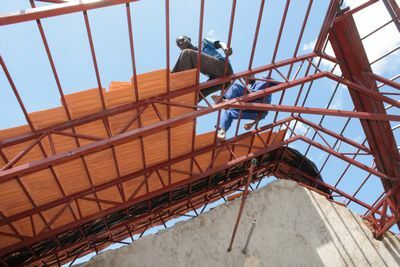 Since about one month the work has resumed starting with thesteel roof-structure. 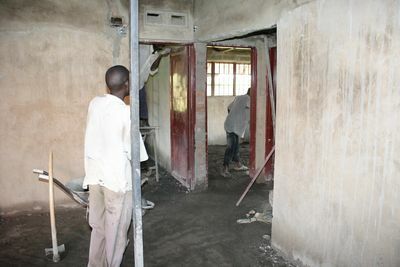 This was followed by the builders who are now going full speed on the plaster-work. 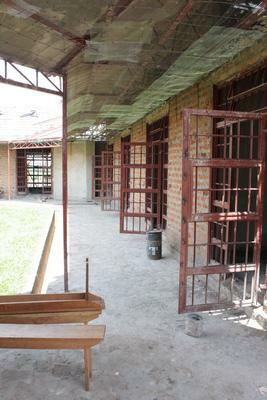 This coming February the 24 new children will have to enter these rooms so we have to hurry. 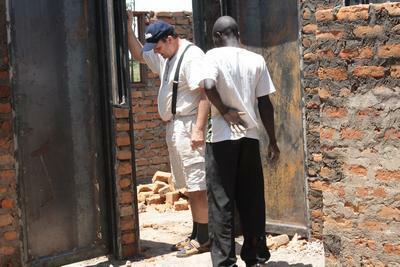 It is a blessing to see all the work coming together. 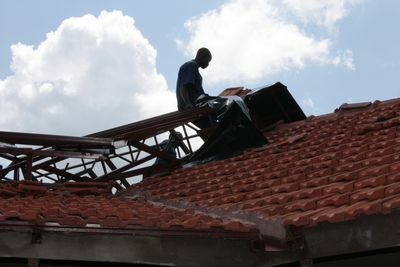 Soon we will bring some 8000 rooftiles to complete the roof. Cor is using the new “DeWalt” jackhammer to break a hole in the rock. 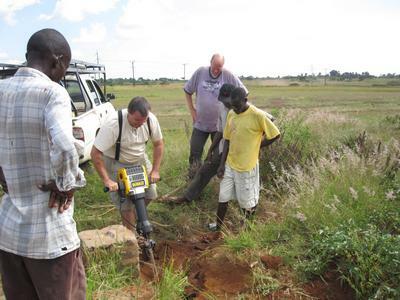 We have started to do the official surveying of our land. 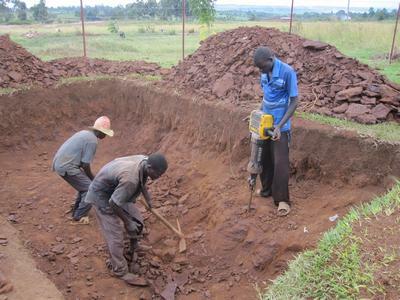 This involves planting special survey-stones that indicate the boundaries. 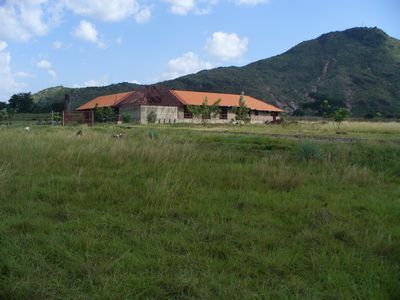 In Uganda the process of obtaining a land-title can be a tideous and long process.